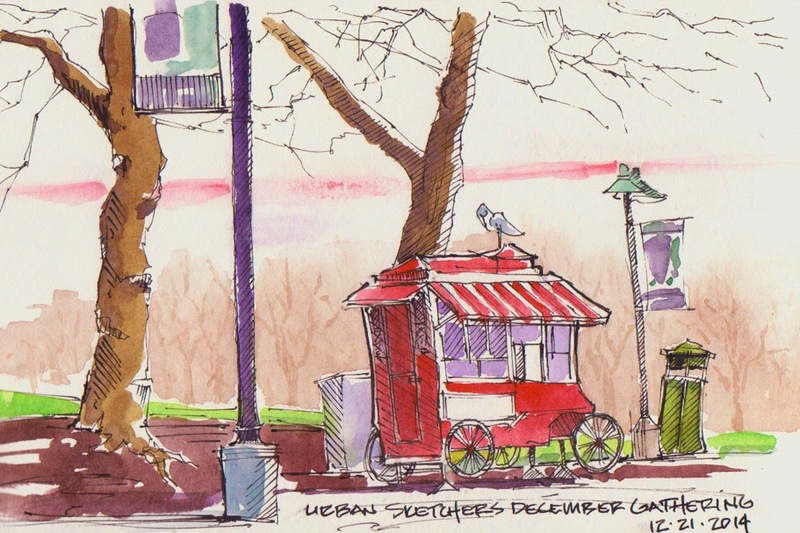 How nice it was to be able to sketch outside in December and then meet inside when my whimpy self got cold. I saw a post yesterday from a European Urban Sketcher blogging about putting alcohol in their watercolor water so the liquid wouldn't freeze while painting in minus13 degree weather. Yes, I will shut up now about being cold. I did this sketch of the dormant popcorn booth called Popcornucopia. It has been part of the International Fountain landscape for as long as I can remember. Pen and ink with watercolor in a Moleskine watercolor sketchbook.